"Refuse to carry the burden of mental and moral weaknesses acquired in past years; burn them in the fires of your present divine resolutions and right activities." Offering SMALL, personalized yoga classes in FERNSIDE and RANGIORA unless otherwise stated. All body types are welcome. CLASSES ARE PRE-REGISTERED with some casual dropin openings. All classes are Beginner friendly and welcoming to experienced practitioners. Wednesday 6:30am-7:10am Energizing Hatha Yoga, Fernside studio (FS), pre-registered only. Wednesday 8pm-8:45pm Discover Yoga, (RH) $10 pre-registered only. “Humility starts to teach the mind and teach the body to surrender, to bow, and to have respect for the soul that has given life to the body. Humility is the key and foundation of yoga. It must be beyond the mat and in everything you’re doing. It eventually opens the doorway to love and to respect. Marina brings in her 29+ years of therapeutic bodywork, anatomy and physiology assessment experience to the class. At times she may give hands on encouragement for alignment or influence a sense of surrender of the self to allow the pose to work effectively. If you have pain or injury or physical challenges and want to experience improvement, these classes may help you, especially for back, neck, shoulder and hip issues. Hatha Yoga is one of the forms of Yoga named in the Yoga Sutras of Patanjali. It is a system of breath and physical movements into strength building poses that affect the physical, mental and emotional body. All physical movement practices of yoga, when combined with breath, fall under the umbrella of hatha yoga. Different teachers have coined names for the style of practice they have refined (ie. Iyengar, Anusara, Power, Ashtanga, Vinyasa, etc.). Many forms of modern hatha yoga practices, especially those that have influenced the West, can be traced back to Tirumalai Krishnamacharya who tuned into the individual and gave them a practice that would benefit their karma best. Many of those whom he gifted with individual practices took their practices to the world and attached their own name to it. The Western approach to yoga is often confused with physical fitness. Yoga practice is different from an exercise class because it is an intrinsic practice using the art of mindfulness and breath focus. Mixed Hatha integrates techniques from different classes and welcomes all stages of life participating. Sunrise yoga is a mixed hatha class designed to energize you for the day. Beginner's Power Yoga is a mindfulness breath practice, using basic and warming asanas. The room is warm which enhances suppleness in the muscles and allows the body to move more freely. The poses are linked by a series of postures called "vinyasa" and combined with rhythmic ujjayi pranayama (breath) and bandhas (energetic locks). There are several similar Hatha Yoga practices following this formula including Ashtanga and Baptiste. It is recommended that ladies avoid this class during their menstural cycle to respect the function of the bandhas and their contraindication during the menses, and to safeguard against injury. Gentle Hatha Yoga looks at overcoming the limitations of the physical body through a harmonious sequence of poses combined with conscious breathing practices. Emphasis on posture and gentle moment of joints. Stress Management Yoga is a gentle Hatha Yoga class with restoration and relaxation poses to soothe an overactive nervous system. Pregnancy Yoga is for 2nd or 3rd trimester women. It is a scientifically designed class to prepare the body for the birth process and nourish a positive experience of pregnancy. During the childbearing process a woman's body is immersed in the creative energies. This class teaches women to trust in the creative process of life. It is important to acknowledge and honour this. This form of Yoga is a well-rounded style of Hatha (asanas, pranayamas, bandhas) Yoga. The focus is on heart centered teaching with emphasis on breath, spinal alignment, development of self awareness & mother’s intuition, and connection with the baby. TESTIMONIAL: “I really enjoyed your classes, and I feel they prepared me for what's ahead more than the official ante-natal classes I attended! 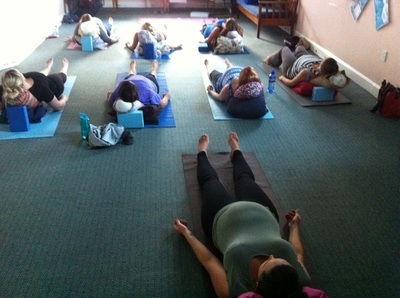 You created a lovely atmosphere in every class.“ Zoe H, Prenatal Yoga student. Mum and Bubs Yoga is a gentle class for mums and babies to help her recovery from the childbearing year, re-establish a yoga practice, or establish core strengthening including the pelvic floor, and postural habits. Some infant massage techniques will also be shared. Babies should be 3 or more months old. Restorative Yoga is a slower paced class emphasizing breathing and holding postures. A profoundly relaxing system that seems to reset the nervous system. The effects linger on for days. CORE integrity and Spinal Alignment are new classes where we explore fascial lines of tension and ease to create a stronger foundation. This mostly floor based yoga series will work with the fascial lines (Thomas Myers - Anatomy Trains, and other inspired research) to create balance in function and more fluidity in movement by working through old injury/habit patterns/muscle weakness and increasing core strength and stability. YOGA NIDRA / "PAJAMA YOGA"
Yoga Nidra is a technique in yoga where we systematically calm the senses and go into a deep state of relaxation. It begins with the breath (pranayama). As the breath slows so does our thinking and as the practice deepens we may become familiar with a rare state of consciousness. The guided practice of Yoga Nidra is sometimes called meditation. Yoga Nidra begins with pranayama (breath), then dharana (concentration to remain awake) then pratyahara (the withdrawl of the senses) which are the preparatory steps towards meditation (dhyana). Meditation is not normally practiced in the reclined position as it tends to lead to the subconscious state rather than a superconscious state such as meditation. This practice is perfect before meditation. It is my sense of humour that calls it "pajama yoga" because participants are often so deeply relaxed that they sleep very well following the process (hopefully not during the process!). Please join us to discover the long term benefits of this practice. MEDITATION is one of the branches of the yogic tree and the most important for development and expansion of the consciousness, especially in this age of materialism and other distractions. There are many, many kinds of meditation and many techniques. All start with Pratyahara, the withdrawal of the senses and few get beyond this without much effort and practice. However, through simplicity, perseverance and an inner connection to the Divine energy or Universal Intelligence, we can restructure our internal mechanisms to create a practice that provides stability and balance to our life. The position of the spine is important for meditation that is why an upright position is recommended for practice. When the spine is horizontal the consciousness is most likely to stay in a subconscious state.